As a member of The Flecktones, Jeff Coffin provides a jazzy undercurrent to the band's hybridization of new age and bluegrass. As a solo artist, he delivers a more traditional jazz sound, offering his own adventurous take on Miles Davis, John Coltrane, Sonny Rollins, and Ornette Coleman. These are huge shoes to fill, of course, yet Coffin does so quite comfortably. His latest disc Go-Round continues along this same path, shining a light on his influences while making a statement that is uniquely his own. On the Arabic-influenced Tuesday's Waterloo, Coffin's dual-sax lead ignites a whirling dervish of percussion and bass that straddles the line between Coltrane's worldly Africa/Brass and Davis' energetic mid-'50s Workin'/Cookin'/Relaxin'/Steamin' period, while Tall and Lanky delves into a New Orleans' style funk-rock groove. The bouncy title track carries the circular, cyclical motion that its name implies — not only does the steady bass of Derek Jones provide a circuitous anchor but each soloist also succeeds in looping his way through the chord progressions. And Zuleikha — with its slow, deliberate gait and gorgeous interplay of viola, saxophone, bass, piano, and drums — could very well be a lost cousin to the Grateful Dead's Stella Blue. 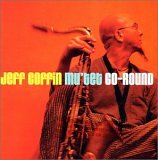 There truly isn't a weak moment on Go-Round as Coffin demonstrates why he's been so highly praised and in such high demand among both jazz and rock artists. (Everyone from Branford Marsalis to Van Morrison, from Dave Matthews to Medeski, Martin, and Wood has provided Coffin with the opportunity to showcase his wares). Where many sidemen often struggle to make it on their own, Coffin clearly has the talent to succeed quite brilliantly. Go-Round is available from Barnes & Noble.